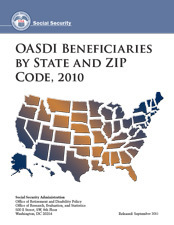 This annual publication focuses on the Social Security beneficiary population at the ZIP Code level. It presents basic program data on the number and type of beneficiaries and the amount of benefits paid in each state, Social Security Administration field office, and ZIP Code. It also shows the number of beneficiaries aged 65 or older. The data are derived from the Master Beneficiary Record, the principal administrative file of Social Security beneficiaries. The Social Security Detailed Office Organization Resource System (DOORS) file was used to associate the field office data with the ZIP Codes. Data for field offices in each state include only beneficiaries in that state. However, some Social Security field offices serve residents of more than one state. To obtain field office totals in these situations, it is necessary to combine data for each state served by the field office. The data include only persons whose benefits are currently payable. Those whose benefits were withheld are excluded. To avoid disclosing the reason for Social Security eligibility of small groups and the amounts of benefits received, a controlled rounding procedure was used for field office and ZIP Code data. Data are not shown for ZIP Codes with fewer than 15 beneficiaries. If the number is divisible by 5 (ends in 0 or 5), then the numbers are not changed. Otherwise, the number is rounded either to the next higher number divisible by 5 or the next lower number divisible by 5, in such a way that the difference between each rounded and unrounded cell value, each rounded and unrounded row total, and each rounded and unrounded column total is less than 5. The dollar amounts in the tables are rounded to the nearest thousand. Diane Wallace in the Division of Retirement, Survivors, and Disability Insurance Statistics and Analysis programmed and compiled the data for this report. Contains all the ZIP Codes in one tab without state-level subtotals, and includes D.C. and all outlying areas.